The ultimate 1-2-3 punch for your little snow-bound dude. A reversible, weather-busting jacket functions as two pieces in one and the cozy bibs deliver the final knockout blow to Old Man Winter. He'll love the rough and tumble big-kid look and you'll love the chill-busting warmth and critical moisture repellency. The ultimate 1-2-3 punch for your little snow-bound dude. A reversible, weather-busting jacket functions as two pieces in one and the cozy bibs deliver the final knockout blow to Old Man Winter. 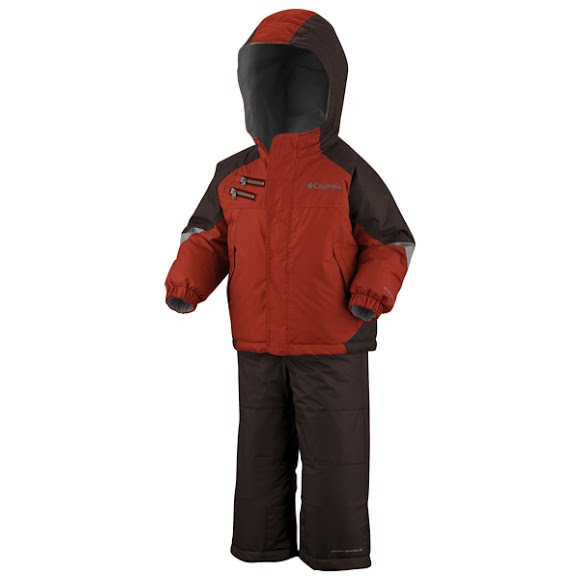 He&apos;ll love the rough and tumble big-kid look and you&apos;ll love the chill-busting warmth and critical moisture repellency. Omni-Shield fabrication ensures he&apos;ll stay dry in a drizzle or light snowfall and when conditions are less severe, he can turn his technical jacket inside-out to reveal a soft and cozy fleece with pop color on the zip and handy pockets for keeping fingers toasty. The attached storm hood is adjustable so you can customize it to fit just right. Matching bibs have elastic at the waist for adjustability and feature soft fleece body and straps so he&apos;ll ski and sled in comfort. Pull the internal leg gaiter down snug over his boots to lock out snow and ice - and when he suddenly sprouts a few inches, let down the handy-dandy grow cuff to reveal another inch of hemline. With Columbia 150g of faux down insulation, you&apos;ll never have to worry about chattering teeth or cold kids getting grumpy.